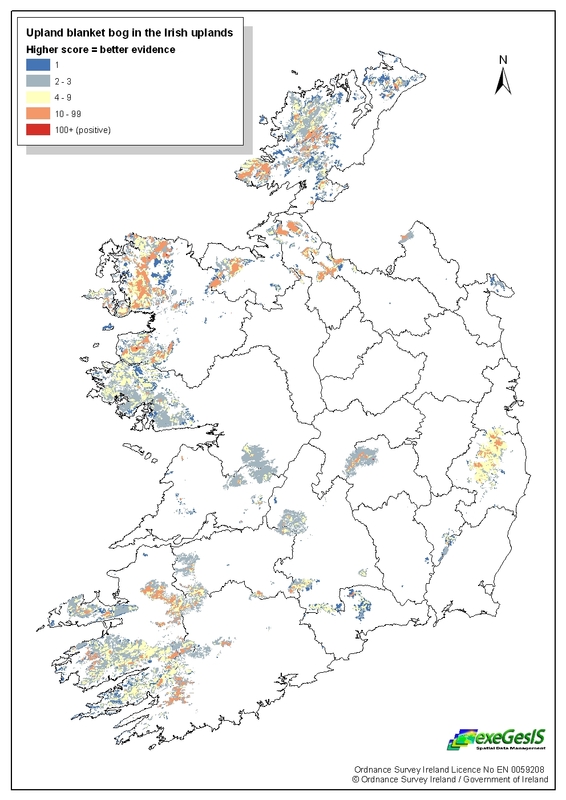 exeGesIS worked as part of a partnership to collate and review existing habitat data and survey methodologies, to develop and test strategies and methodologies for a national survey of Irish upland habitats, and to devise program to monitor upland habitats. This project involved the collation and evaluation of a suite of ecological datasets, the production of an indicative map of upland habitats, an investigation of upland field data collection options, and capturing all survey data to GIS. In order to create the indicative map we combined all relevant datasets into a single ArcGIS personal geodatabase containing over 1.8 million polygons. This geodatabase was linked to an Access database application that assessed the likely habitat based upon the reliability of each source dataset and suggested the most likely habitat for each input polygon. The assessment was made based upon an agreed rule base. Using this assessment the application generated a new personal geodatabase that incorporated the classification of each polygon by likely habitat and an indication of the reliability of the assessment. In this way we were able to incorporate all available data in the assessment of each polygon, rather than prioritising the data contained in certain datasets over others. Click on the map to the right for a larger image.